We finally got rain late on Wednesday nightÂ which would have kept many people awake as it was joined and by some very strong westerly wind which ended in the early hours of Thursday morning. I think most of New ZealandÂ is getting a bit of rain and unsettled weather at the moment and I believe that it will be welcome by most. I was guiding first thing this morning on the Tongariro and my first port of call was my website to check if the rain had any effect on the river flows which I was pleased to see that it was still fishable at 24 cumecs and seemed not to be rising nor dropping. Upon arriving at the river at 8am I was pleased to see the river in perfect condition with a slight colour in it I thought it was goodÂ to give a little orange glo bug a try. I passed Jason in the head of the Plank pool which was already hooked up to a scrappy little Rainbow from the fast water so things were looking good. 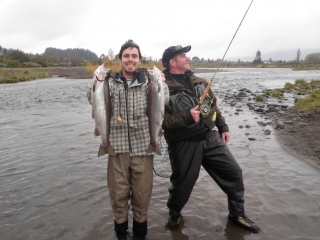 Below Tongariro Lodge there is a perfect little lie which always fish’s fairly well in the winter first thing in the morning and my client proved this when he hooked up twice in as many casts managing to land one fairly fresh 3lb hen. The glo bug was working and I thought we were in for a good morning in the braids as we had only fished the one run and it did not seem that many anglers were about and we could leisurely pick fish from different runs all morning. Unfortunately this plan was wrecked when the river all ofÂ a suddenly became very muddy and was carrying heaps of pumice, pine needles, bottles and other debris which has accumulated over summer on the banks of the river. The Tongariro managed to rise above 50 cumecs in under an hour for some reason and I cant help but think that it was something to do with a power company diverting water down it to wash out their gates as it would not have been done for sometime? I feel sure that the river could not have risen this quickly with just natural rain or run of-not this quick. Unfortunately thatÂ is what we have to put up when fishing aÂ river which they generate power from. I should be thankful that I had not crossed a deep water crossing but was in the braids which has many out points. Fishing for the next hour was a bit of a waste of time so we pulled the pin and drove back to the TT rip for the morning and joined about 10 anglers forming a picket fence-relaxing way to fish. Fishing should be very good over the next few days in all Taupo rivers and I would assume that the fresh would have pulled up good numbers of trout from the lake to hopefully form our first real winter spawning runs this season. Glo bugs will be on the menu for most trout and you should pick fish up in the coloured water using orange as a base colour and turning to pink when conditions clear. I think the rivers may have a little more pressure on them this weekend as most of New Zealand would have been watching the weather and will be assuming the best, so get out early! I would be concentrating on the lower river or somewhere about the braids as these fish will still need a day or so to get into the system and settle into a run or pool. The river mouths at night will be worth a look as-well as these fish will be wanting to enter under the cover of darkness so the rewards will be there for those who venture out.